Dietitians speak out about the new federal school meals program that many kids say is leaving their stomachs growling by the end of the school day. The start of the school year welcomes students with the promise and expectation of filling their minds with knowledge and—for the 32 million in our nation’s school meal programs—their bodies with nutritious foods. Only this year the implementation of the new federal lunch standards mandated by the Healthy, Hunger-Free Kids Act of 2010 is—ironically—leaving kids hungry. And this youngest generation is speaking out. Fueled by the pangs of their growling bellies, complaints from our nation’s youths have spread across the country via blogs, websites, boycotts, strikes and, most famously, YouTube. A video parody—viewed more than 1 million times—has students singing “We Are Hungry” to the tune of fun.’s “We Are Young.” The student-teacher compilation, made in the high school of a small Kansas town, protests the lower calories and limited carbohydrates and proteins under the new lunch standards. A call to action, the video opens with statistics on the minimum calories necessary for high school athletes and ends with a plea to all students to voice their opinion. The video grabbed the media’s attention, cranking up several notches the volume of the public outcry and putting the new school lunch standards into mainstream focus. The perception is that the new lunch standards serve a radically changed menu from previous years, certainly one that skimps on calories. In reality, most of the changes have been progressively introduced in schools since 2009 when the Institute of Medicine developed recommendations that formed the basis for these standards in direct response to the childhood obesity epidemic. School nutrition professionals who were aware of the pending recommendations to increase the amount of fruits, vegetables, and whole grains served and lower sodium, saturated fat, and calories got right to work. Many schools embraced the imminent changes in policy and worked hard to introduce and integrate new and colorful fruits and vegetables into their meal programs so the eventual adoption of new standards would be an easy and seamless transition. Programs such as “A Tasting of the Rainbow” at Anne Arundel County Public Schools in Maryland showcased a variety of fruits and vegetables—some the children had never seen before—and encouraged them to taste a free sample. The response, according to Jodi Risse, MS, RD, LDN, division of food and nutrition services, was positive on the lunch line where these featured fruits and veggies were incorporated into the menu. Familiarity was the first step toward broadening the children’s formative palates. According to the USDA, a typical lunch menu under the old standards might include pizza sticks (3.8 oz) with 1/4 cup of marinara sauce, a banana, 1 oz of raisins, and 8 oz of whole milk. Compare that with a typical menu under the new standards: one slice of whole wheat cheese pizza, 1/2 cup of sweet potato fries, 1/4 cup of raw grape tomatoes, 1/2 cup of applesauce, 8 oz of 1% milk, and 1 oz of low-fat ranch dip. The healthful addition of fruits and vegetables and even whole grains isn’t the problem. Students say they’re not getting enough calories to satisfy their hunger. According to Deborah Beauvais, RD, CDN, SNS, district supervisor of school nutrition services in the Gates Chili Central and East Rochester Union Free school districts in western New York, that’s a case of perception vs. reality. “The calories a year ago were still in that same range,” she explains. The main difference is that the old standards set a target number of calories, which could be exceeded, while the new standards set a range of calories that’s capped with maximums. These guidelines are “based on science and are written for the center of the bell curve. It’s too much for some, too little for others,” she says. A quick glance at government calorie recommendations confirms this. The USDA recommends that boys aged 14 to18 consume an average of 2,200 to 3,200 kcal/day and girls aged 14 to 18 take in 1,800 to 2,400 kcal/day for a healthful, balanced diet. Assuming the average teenage boy or girl falls somewhere in the middle of these ranges, the calories they consume at lunch will equate to about one-third of their daily calories. Assuming again that these teens are eating three meals as well as a snack or two each day, there shouldn’t be a calorie deficit. However, the USDA clearly states that these ranges are estimated amounts of calories needed to maintain calorie balance and that individual calorie needs may be lower or higher. According to information from the American Dietetic Association Complete Food & Nutrition Guide by Roberta Larson Duyff, MS, RD, FADA, CFCS, those calorie requirements jump to 3,500 or more for athletes and those involved in strenuous exercise. Clearly, every lunch won’t fulfill every student’s caloric needs, but according to Beauvais, even the old standards didn’t sustain all the kids. Her first question for today’s students complaining of hunger is “Are you eating breakfast before you leave home or at school?” She says lunch isn’t intended to supply the entire day’s calories, but if students are hungry beyond what’s on their tray, schools offer extra portions. With all the choices of fresh fruits and vegetables at kids’ disposal, certainly something should be appealing, Beauvais adds. Cipullo believes the reason kids aren’t eating enough calories is twofold. The new offerings, she says, need to be more visually pleasing and palatable. But “keep in mind that kids have been accustomed to eating processed foods laden with added sugar, foods that appeal to them even if they’re not necessarily nutritionally adequate.” Rather than calories, she says, the attention should focus on how to serve positive change in the way students view nutrition and food. Beauvais, whose son is a 6-foot 3-inch athlete, isn’t surprised that the lunches he eats at school aren’t enough calories to carry him through his afternoon sports practice, but they weren’t last year either. When this is the case, Beauvais says these kids need another plan for the afternoon, which might mean bringing a snack from home or money for a healthful vending machine option. It has become a challenge on the foodservice side as well, which Beauvais describes as “kind of like a puzzle.” Take that burger, for example. To accommodate the addition of a half-ounce slice of cheese, you’d first have to make the patty a half-ounce smaller. Well, they don’t come in a 2 1/2-oz size. And sandwiches—a staple on every lunch line—are no longer so simple under the new standards. A cap of 9 oz of bread, at 1 oz per slice, makes a challenging breakdown for the five-day school week. There might be a future for an open-faced sandwich on the menu, Beauvais says. Laudable as the efforts behind the new standards are, they’re not enough, according to two former New York City public school teachers who have taken the issue of obesity in school children into their own hands. Deborah Lewison-Grant, MA, MEd, and Carolyn Cohen, MEd, started their own nonprofit organization called FoodFight to include teachers, who they believe are the missing link in the growing obesity epidemic. FoodFight also involves a curriculum that teaches teens about nutrition and how the media influences their food choices. “You can’t revolutionize food without revolutionizing the culture in the schools,” Cohen says. Without buy-in from both adults and students on campus, the healthier lunches won’t change anything. Even after the dust settles and the protests wane, negative attitudes and food waste in the cafeteria are likely to continue. FoodFight’s goal is to improve the health and life outcomes of students by bringing teachers and personnel into the conversation. “Their health and wellness is critical to their job. Corporate wellness is so accepted, but we don’t see that in schools,” Lewison-Grant continues. By running wellness programs for teachers and school staffs, Cohen and Lewison-Grant believe their graduates will bring an empowerment and energy for healthful living and eating to the students. “If you engage the entire staff, you can ignite an important process that can change food in schools,” they say. In addition, Cohen and Lewison-Grant believe the new lunch standards would be more effective if they were introduced within a context. “A new set of guidelines without explanation is confusing. It’s missing the education component,” Lewison-Grant says. When the students don’t understand the reason behind their role in the changes, it becomes a control issue. “Food is the one area over which they exert control,” she explains. “They can decide what to put in their mouths, but they don’t understand the forces shaping it. School lunch isn’t exempt.” This is where the adults in the school can lead students through the changes and together change the current food climate into a healthful one. — Lori Zanteson is a food, nutrition, and health writer based in southern California. • Periodically invite chefs to your school to teach foodservice staff new, healthful recipes. • Rotate students through the school kitchen to help prepare meals and offer new ideas for dishes. • Have children plant gardens and eat the food they grow. • Include cooking classes in the school’s curriculum, and teach kids how to make healthful, tasty food. • Create yearly school cookbooks featuring the students’ favorite healthful recipes. • Teach students how to modify their favorite recipes to develop more wholesome, healthful ones. There are no specifications regarding the types of vegetables to be served. There are weekly requirements for dark green, red/orange, and starchy vegetables and beans/peas (legumes) plus other vegetables as defined by the 2010 Dietary Guidelines. 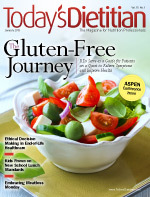 As of July 1, 2012, at least one-half of the grains served had to be whole grain rich. Beginning July 1, 2014, all grains must be whole.